You've probably received quite a few holiday cards by now. I love to display Christmas cards to use as part of the decorations. It's so much fun to see all of the pretty cards and everyone really enjoys seeing all of the cards, even if they don't know all of the senders. This idea from Martha Stewart is easy and fast. You can display many cards on a garland going up a set of stairs. Alternatively, this would also look great on a mantle. Use tiny decorative clothespins from a craft store to attach the cards. 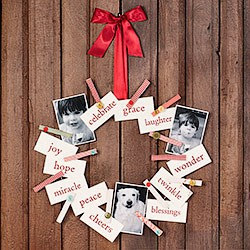 Make a Christmas Card wreath at Paper Source in one of their classes. You could use a sturdy cardboard wreath frame as a base and simply glue or clothespin the cards to the wreath. You'll probably have to choose your favorite cards to display on this wreath because once it's finished, it's kind of difficult to add things to it. 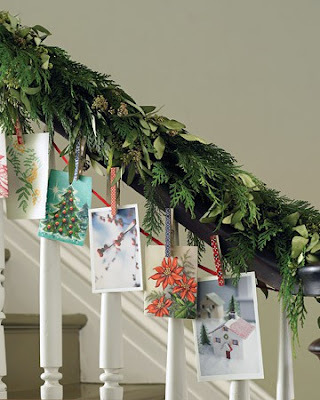 Better Homes and Gardens has another fantastic card display idea. 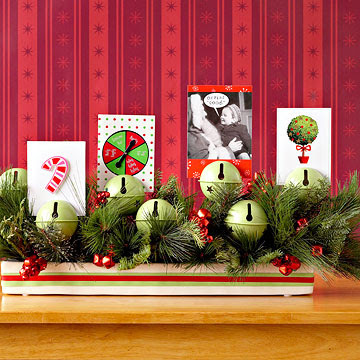 Slide your Christmas cards into the slots of decorative bells. The cards will stand up straight in the bells. The benefit of using this idea is that you can take your cards out of the bells to store after this holidays. It's reusable from year to year. Here's another fantastic idea from Martha Stewart. 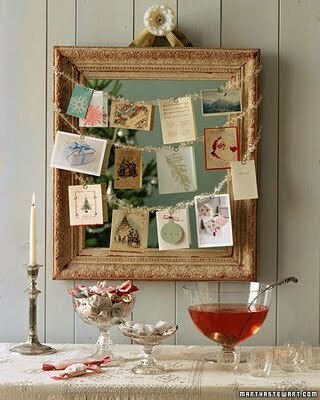 Adorn a mirror with shiny metallic garland and clip your cards on the garland. We have an exposed brick chimney and we display them there! I bought a few of those big picture frames with a ton of open spots and we put our photo cards in them and display them all year long. It keeps photos of people we love visible! And as baby announcements or other photos come in the mail, we switch some out and add to it! Cute ideas! I ned to start display ours. Right now we just keep them in a Christmas bowl on my table. I love these ideas. We display holiday cards at home, and I put them on my shelf at school!